Il Pezzo 6 Table in Berlin! Il Pezzo 6 Table is the protagonist in this amazing flat in Berlin. Let be inspired by the glamorous atmosphere! Il Pezzo 6 Consolle è protagonista sul set esclusivo del programma Ma come ti vesti? !, in onda ogni martedì ore 21:10 sul Canale 31. Designed by Philippe Starck, Ramses.life is a unique space in Madrid where lifestyle and cuisine are conjugated to make clients live an extraordinary experience. 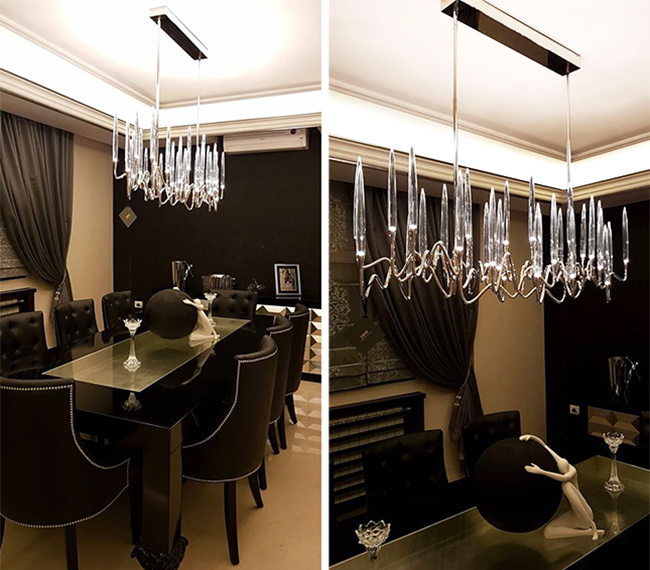 Starck selected Il Pezzo 3 Endless Chandelier for decorating the interiors. Il Pezzo 3 Round Chandelier and Il Pezzo 3 Wall Sconce was selected for Horto Convento Hotel to enrich the hall. Horto Convento is a magical mix of contemporary and tradition and it is situated near Piazza del Carmine in Florence. We can admire the magical atmosphere that Il Pezzo 3 Round Chandelier creates in a stunning Liberty villa in Florence. Philippe Starck has unveiled his first creations for the Rosewood São Paulo — a luxury urban hotel and spa within Cidade Matarazzo, the Filomena Matarazzo maternity historical complex. Located a block away from Paulista Avenue, the tower’s façade has been designed by Jean Novel. Philippe Starck — appointed artistic director of the project — selected Il Pezzo 3 Long Chandelier for the interiors. We can admire Il Pezzo 3 Chandelier in a stunning historic palace of Bologna, Italy! Thank you to our nice clients for this enchanting atmosphere.